What’s up, doc? Oops! Wrong reference 😛 What’s shakin’, bacon? Not bad. How’s it hanging?? There we go!! This is how it starts for Marvel’s newest dude-est duo: the wascally Web-Head and the motor-mouth Merc!! 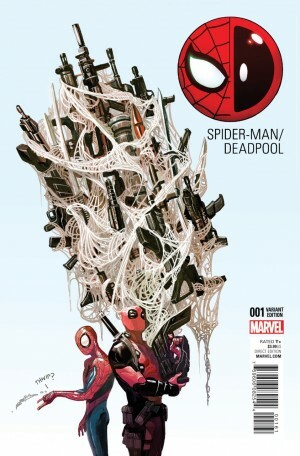 It’s no secret that Wade Wilson crushes seriously hard on the wall-crawler. In fact, he’s relishing their bonding since they are bound upside down about to experience an eternity of suffering from Dormammu and his Mindless Ones. Their fate seems sealed until Spidey hip-checks DP hard enough to access his sword. Spidey tossed the red-and-black-clad blabbermouth into a pile of Mindless Ones out of fear but mostly frustration. 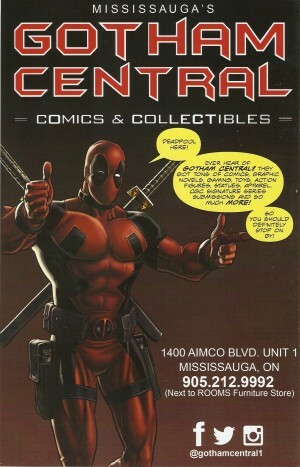 Deadpool breaks the fourth wall!! He asks his pal about narrating the flashback. There is no answer to the question but a brief indeterminate time ago Spidey is tussling with one of his lame-o villains: Hydro-Man. Everything was going swimmingly [natch!] until loop-de-loop shows up. DP now has an app upon which he relies for his comportment. 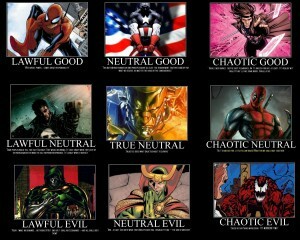 The choice points to ‘chaotic neutral’. HM has a hole blown in his liquidy side before the loose-some twosome are teleported to Dormammu’s Dark Dimension. The fight for their lives rages on. DP pulls the most out-there maneuver: inserting brains into the thoughtless [literally!] minions transforming them into the Mindful Ones!! Mr. Mile-a-Minute lets it slip after their successful escape that he was field-testing the red-and-blue crimefighter for a gig with his new business venture. Spidey is beyond outraged. Speaking of business…Spider-Man is secretly Peter Parker, CEO of Parker Industries unbeknownst to his clingy colleague. I’m sure there’s an equivalent of someone below that >_^ Unlike Tony Stark, Petey can’t juggle it all. He’s extremely fortunate to have an amazingly capable individual in his stead: Anna Maria Marconi. His extracurricular activity has gotta go or the company takes a nosedive. Nothing is ever easy in the life of a super-hero. Hydro-Man returns, upgraded to sewage slop. DP lost his hand when Spidey unleashed the cute little Bamf in his possession. He has no qualms tossing Wade into the muck with incendiary grenades. HM is gonzo. Mr. Wilson is only half the man he used to be. Spidey is about to swing away. He is less than friendly when it comes to the crazy Canuck. DP breaks down and admits that he’s doing his utmost to be a proper hero. He is inspired by Spider-Man and wants to earn his respect. The serious moment passes quickly and Wade returns to his crazy comical self. The Webslinger continues to express his hatred for the pest and realizes he will need major psych sessions. 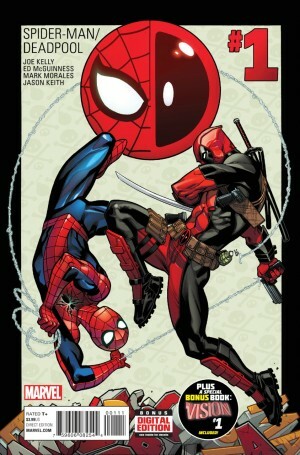 Spider-Man isn’t wrong in despising Deadpool. Complete 360!! The Merc lives up to his name. He hired a miniature alien to pose as the dread Dormammu. Since the theatrical ET didn’t really follow through, he is only paid half his earnings. DP decides the time to pretend is over. He wants his franchise to soar. His moral compass app selects ‘heroic good’. The decision is made: he must slay Spidey’s true self – Peter Parker. This should put him in excellent standing with the amazing arachnid. Ladies and gentlemen, boys and girls, other identifiable beings: rounds of applause!!! There is celebratory cause – the happy reunion of Joe Kelly and Ed McGuinness!! For all you uncouth and uneducated individuals, these two men were the progenitors of the first DEADPOOL on-going series!! The Regenerating Degenerate is now on volume four well past two hundred and fifty issues. How’s that for longevity and popularity?? The phrase ‘Welcome home’ is entirely applicable in this initial issue. There is no indication whatsoever that a little over nineteen years have passed since Mr. Kelly handled the insane assassin’s exploits. The laughs are plenty with innuendo up the wazoo. There are no apologies necessary for the raunchiness. 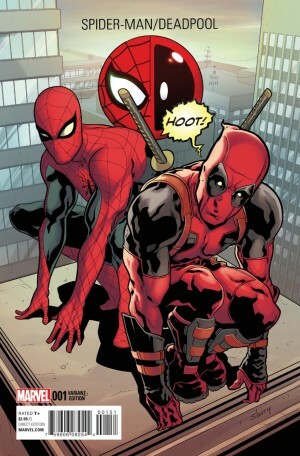 Deadpool’s love for Spider-Man is beyond bromantic, that’s all I’m saying. It is pure brilliance that Mr. Kelly pairs him with the webspinner to make them Marvel’s Oddest Couple. Ed McGuinness deviates from his over-expressive style ditching the over-hulking bodies for lean and lithe. Bravo!! Exactly how it should be given the protagonists’ presence. 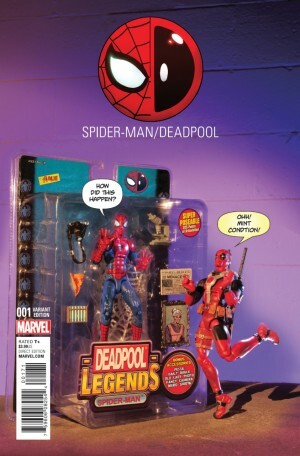 Upon a second look, Deadpool looks a bit more bulky but that’s muscle coupled with gear. Dormammu’s imposing frame was a surprising fake-out. The Bamf is devilishly cute. Mark Morales keeps solid lines around Spidey, stressing his seriousness whereas DP seamlessly fits in making him three-dimensional. Jason Keith rages red. In a good way!! It’s the commonality between the two divergently ideological heroes. DP has the nerve to say that Spidey copied his costume even though that’s chronologically inaccurate. Joe Sabino gets in on the fun with the massive SPLITCHHHHH and the ASPHALT impact. Hi-larious!! The characterization is on the nose! The action scenes are impeccable!! 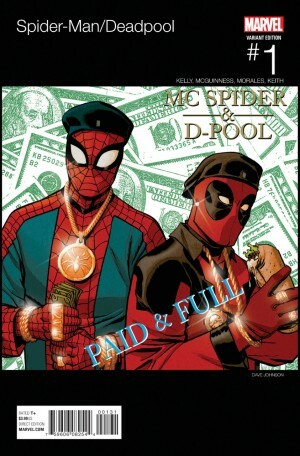 Spidey and DP move like Jagger themselves. The cheese factor is heightened by the puns. I’m curious to see how long this beautiful friendship will last. I give this book ‘Chaotic Good’ [8/10] in honour of DP’s moral compass (but really D&D – Dungeons & Dragons). Don’t pay any mind to the actual image below.